You’ve never had Red Snapper quite like this! Our Snappers are lightly breaded with panko and then pan seared to a crispy, yet mouth watering, flaky finish. We top this dish with an orange ginger glaze and serve it all over a garden vegetable risotto. If sweet and spicy is your dream combination, then we have the perfect entree for you. We pan sear the finest Atlantic salmon and top it with black and white sesame seeds and a honey Sriracha glaze. This delectable dish is served with a garden vegetable risotto. Looking for something a little more on the spicy side? Our Ahi Tuna is pan seared and then lightly coated with black and white sesame seeds. Next, we add our special spice blend. For a delicious finishing touch, we top the tuna with wasabi mustard aioli. This flaky feast is served with creamy roasted tomato risotto and roasted asparagus. We sear this mahi-mahi and serve it straight to your table with a mushroom and parmesan risotto. With roasted broccoli on the side and Asian slaw topping this dish, we know you will love every bite. If blackened mahi-mahi is more your style, we would be happy to provide that for you upon request. Sometimes fish alone can’t satisfy your craving! When that’s the case, it might be time to add some bacon to the mix. This dish includes seven jumbo shrimp all wrapped in Applewood bacon and topped with our house spices. We bake this dish in our 600+ degree open flame fire deck oven and serve it to you with tequila mango BBQ sauce, roasted red potatoes, and broccoli. For your crustacean lovers, we have our crab cakes! We’ll cook up two of our signature crab cakes and serve them to your with garlic mashed potatoes, roasted asparagus, and finished with our wasabi mustard aioli. These delicious tacos are perfect for finishing a day in the sun with loved ones. We fill three mini flour tortillas with your choice of grilled mahi-mahi, ahi tuna, or sauteed shrimp. Next, we top these tacos with Asian slaw, mango salsa, crushed tortilla chips, and chipotle aioli. With some roasted veggies on the side, this meal will keep you satisfied for the rest of the night. Come to Our Virginia Beach Restaurant! 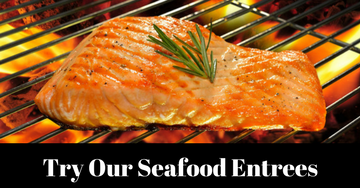 FIREBREW Bar & Grill is the perfect choice for your family when you are looking to satisfy your seafood craving. To learn more about the other incredible meals we offer, feel free to check out our menu! We look forward to seeing you this evening for dinner. Or, bring your friends out for a delicious happy hour, featuring our self-serve wine station. Contact us to learn more if you would like!